I don’t typically talk much about the brain in Tracts of Revolution, where it’s more about how spirituality, religion, philosophy and science offer frequently contradictory (but possibly at some deeper level, complementary) accounts of reality. This three-pound organ and its central place in our ongoing efforts to live happy and meaningful lives is, however, my veritable obsession in another blog of mine, called Brain Tracts. Perhaps this brief excursion into the neuroscience of God will entice you to check it out. In order to beat down the grass a bit and make a path to this grand topic of God, let’s begin by talking about what your brain is doing right now. Throughout the day your brain is entertaining a series of loosely chained scenarios, as you move in and out of the various environments and situations of daily life. One of its important contributions is the faithful representation inside your mental theater of what’s going on outside and around you. As you drive your car on the road, sit behind your desk at work or school, or engage a conversation with friends, your brain attends to (or bends toward) the stimuli coming across its sensory outposts – the classic five (or so) gross senses of your body. Gathering together these numerous strands of sensory information, your brain projects this composite representation on the screen of your conscious awareness. Whether it’s an apparently seamless and dynamic movie unfolding there or a “still shot” of something you are studying with concentrated effort, the focus of your attention is your mental object. As it flashes up there on the screen inside your mental theater, it is only information. In my attempt to make it as uninteresting and impersonal as possible, I will simply name it: “IT.” IT is what you are focusing on right now. Now, your brain isn’t just a fancy mechanism for collecting and processing sensory information from the environment – although that in and of itself is pretty amazing indeed. Your mental object might instead be something you are recalling from yesterday or five years ago; or again, IT might be something you’re making up on the fly, as it were, by the wonder-working power of imagination. 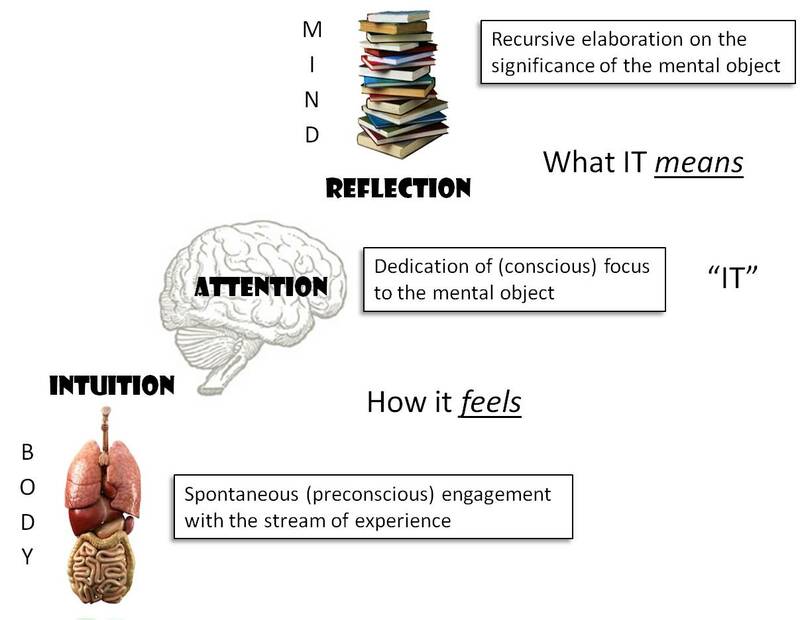 Perception, recollection, and imagination are thus the three channels by which your brain brings your mental object (IT) to the screen of present attention. The debate between theism and atheism over the existence of God gets predictably hung up at this point, with one side (the atheists) refuting it on the claim that this particular mental object has no basis in the sensory-physical realm of our senses and was simply made up (imagined) by superstitious storytellers. Theists will typically counter by appealing to sacred writings that record and inerrantly preserve the actual (miraculous, supernatural) experiences of people many centuries ago. The responsibility of faith today is to trust these accounts as a reliable witness to the objective truth of God’s existence. In my opinion, this debate is tired, boring, and pointless. The theists are misreading their sacred texts by taking the stories of God literally, and the atheists are playing right into it by taking the theists literally. For a way through the stalemate, we need to go back to the brain. Your brain is “wired” into your body through a complex nervous system that reaches out to your muscles, organs, glands, tissues and cells. I call this a braintract – specifically your lower braintract, since you have an upper one as well (which we’ll get to in a bit). With brain-imaging technology and carefully controlled experiments, neuroscience has discovered that your brain is constantly monitoring the stream of experience flowing below the threshold of conscious attention. This spontaneous engagement with the stream of experience is called intuition (or at least that’s what I’m calling it), and it’s where your brain is “picking up” all kinds of subtle impressions of what’s really going on. Of course, “stream of experience” is only a metaphor – although I hasten to add that the word only here should not be taken to mean merely or nothing but a metaphor. Metaphors are image-words used to convey something that cannot be grasped in objective terms. Many of our most powerful experiences in life are of things that have no separate existence of their own but are nonetheless real to us by virtue of the unmistakable and frequently overwhelming feelings they evoke. Any attempt to extract such metaphors from the moving stream of experience and strip them of feeling ends up destroying them along with the connection to reality they provided. 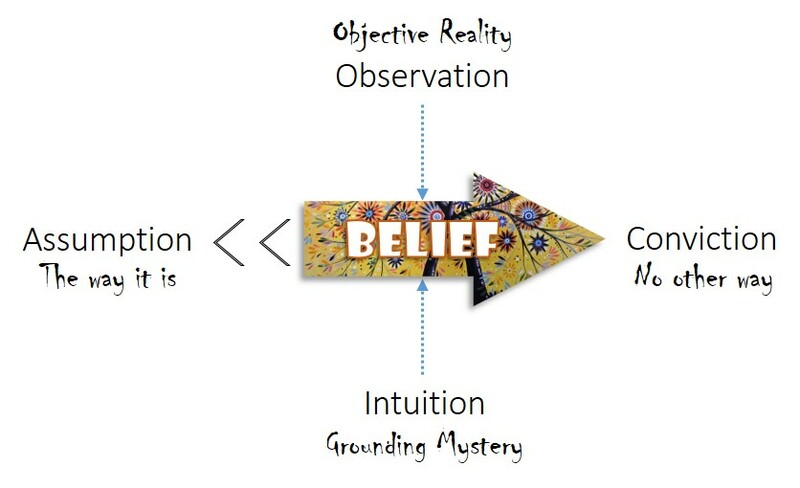 I have argued that religion began as a way of contemplating the present mystery of reality. Its deepest and earliest metaphor is the ground of being – the providential support and creative source on which all depends, moment to moment. The feeling of this ground is registered in your nervous system, generated out of a syndrome of countless synchronized events transpiring in your cells, glands and organs. The present mystery of reality is grasped intuitively and “known” spontaneously in the rhythms of your breath, your heartbeat, and the nerve cycles of consciousness. Religion thus began with a metaphor that conveyed a profound and essentially ineffable experience of reality as the rising support of being-itself. Quickly enough – for the next task of religion is to tie the concerns of daily life back to this deeper support – it further clarified the ground metaphor into the natural incarnations known intimately by every newborn mammal: mother and (to a lesser extent) father. The earliest representations in religion of the present mystery of reality were the generative provision of Mother Earth and the supervisory protection of Father Sky (or heavenly Father) – both archetypes (or “first forms”) of the grounding mystery. It’s important to understand that these primordial representations (and earliest mental objects) of reality were not of a being in the earth and another being in the sky. 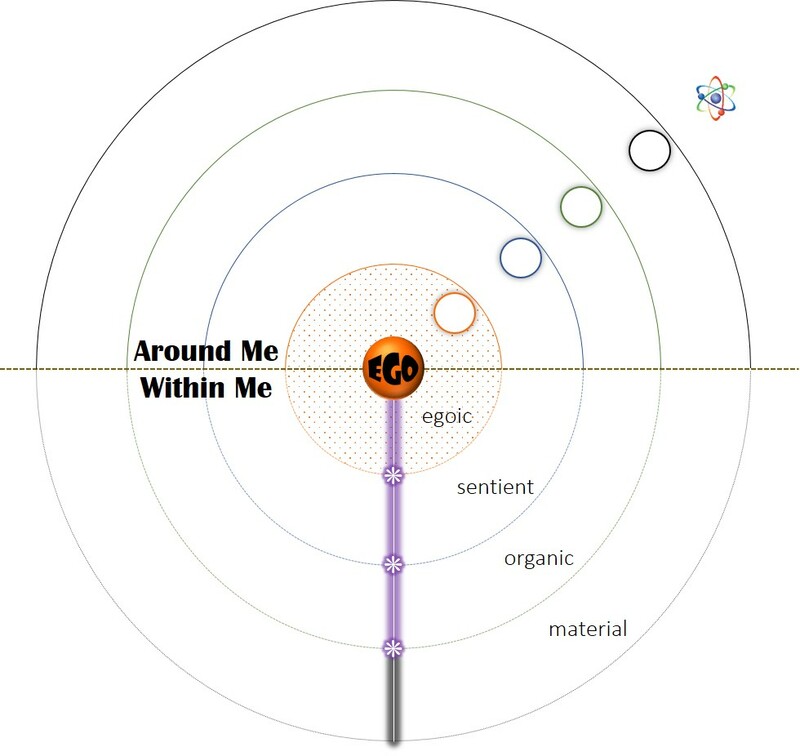 As archetypes of the ineffable mystery of being-itself (i.e., the ground metaphor), they translated a deeply intuitive experience and established a relationship to reality that acknowledged our natural dependency and communion with the universe. So far my theory explains the origins of our concept of God, beginning in the spontaneous engagement with the stream of present (and preconscious) experience. This intuition of reality as provident support and creative source was first grasped and communicated in the ground-of-being metaphor, but pretty quickly got translated into the specific incarnations of Mother and Father – and by extension, Mother Earth and Father Sky. Once your brain fastens the focus of attention on a mental object, it sends this information via your upper braintract to your mind where its meaning will be determined. 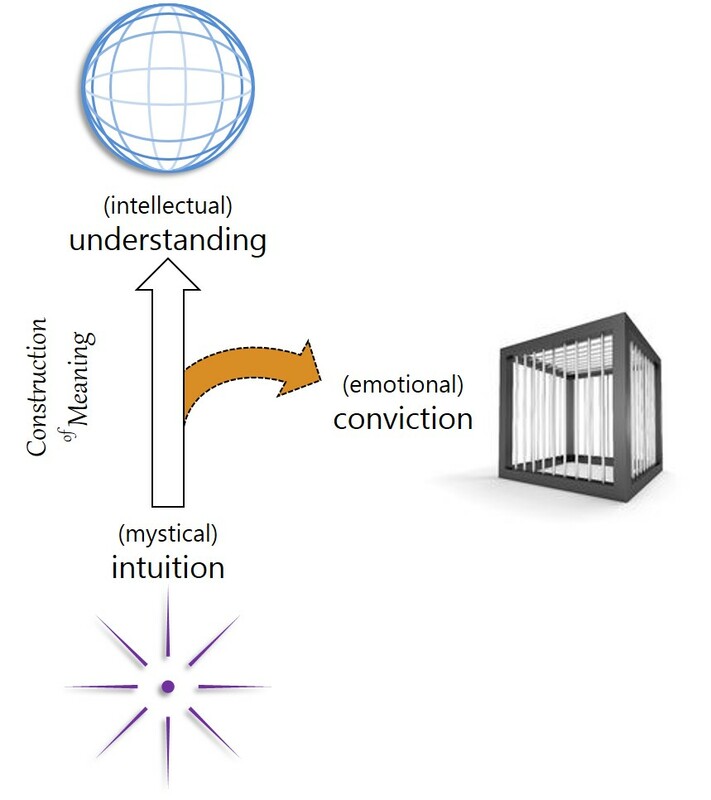 Your two braintracts are constantly working in parallel, with the lower braintract (your body) converting the information in your brain (the mental object) into an energy-state of feeling, and the upper braintract (your mind) translating it into a narrative composition (story) of meaning. Your mind is a storyteller and perpetually busy constructing narratives around your mental object, which serve to frame a context, establish causality, project possible scenarios, predict outcomes, and generally link the mental object into a web of associations that makes it mean something. Storytelling is recursive elaboration on a mental object, or what is commonly called reflection: the bending-back of your mind on a work-in-progress, weaving strands of identification and significance around it, like a spider bundling up a trapped fly in sticky fibers. As the mind cannot help but construct meaning when your brain presents it with a mental object, telling stories (including theories, hypotheses, explanations, reports, excuses and lies) is its primary business. Coming back to religion and its concept of God, this business of storytelling is how humans make sense of their experience and link everything back (Latin religare) to the grounding mystery. 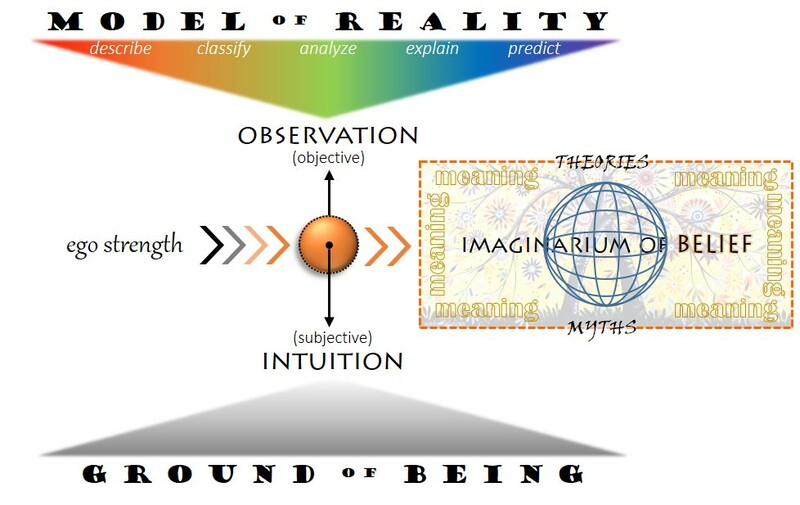 Yes, this is mythology – not fallacies, deceptive tales, or bad science, but dramatic narratives connecting our life-world and daily concerns to the provident reality supporting and supplying our existence in this moment. The many deities of religion are personifications of hidden agencies in the rhythms of life and death, the landscape and its resources, the seasons and catastrophes that shape our experience in the world. The danger of telling stories about the gods (these hidden agencies) is in our mind’s need to perform further recursive elaboration on these elaborations – constructing the god’s genealogy and sibling relations, reputation and character, sovereign will and inner thoughts – all of which may encourage the belief in his or her separate existence. As the archetypes of Mother Earth and Father Sky reproduced into the countless offspring deities of the regional and tribal myths, the actual origins of God were forgotten and the literary gods became literal beings. The stage was thereby set for the theist-atheist debate. Who’s right? Neither one. If – and I grant this is a BIG if – we can look through our deities, descend along the winding path of our sacred stories and deeper into the intuitive experience that got everything started, we will be able to relax our grip and loosen up. It all began with the waking of consciousness to the provident uplift of life in this moment. You’ve never left it, despite your long and tired journey in its quest. One day you will close your eyes and unwind completely into a mystery beyond name and form.